Photos by Asia Morris. Route map courtesy of the City of Long Beach. The Long Beach Circuit Race is 83.6 miles and 12 laps. Local cyclists, Amgen Tour of California President Kristin Klein, Vice Mayor Rex Richardson, Long Beach “Bicycle Ambassador” Tony Cruz, Second District Councilwoman Jeannine Pearce and other officials revealed this morning the Long Beach Circuit for Stage 1 of the tour, to take place Sunday, May 13. Returning to Long Beach since the city hosted the overall race finish in 2007, the official first stage of the 2018 Amgen Tour of California will be a 7-mile circuit to start and finish on Shoreline Drive near Shoreline Village and the Long Beach Convention Center. The circuit will use portions of Shoreline Drive, Ocean Boulevard and Pine Avenue, as well as Bixby Park, Bluff Park, Retro Row and downtown areas. Tony Cruz is the current program specialist for the city’s Department of Public Works and one of the officials who has been working with AEG, owner and presenter of the 13th annual race, over the past six months to help bring the tour to Long Beach. The former professional cyclist played a part in designing the course and said he hopes to generate local excitement over the major stage race. Indeed, three of the sport’s best sprinters are confirmed to race: Mark Cavendish (Team Dimension Data), Marcel Kittel (Team KATUSHA ALPECIN) and “King of California” Peter Sagan (BORA-hansgrohe), the first three-time consecutive world champion who also holds the California race record for the most stage wins (16), AEG announced today. Sagan will begin the Amgen TOC defending his seventh California Green Jersey for the tour’s overall sprint competition against 30-time Tour de France stage winner Cavendish, and Kittel, who won the opening stage of the TOC in 2017. 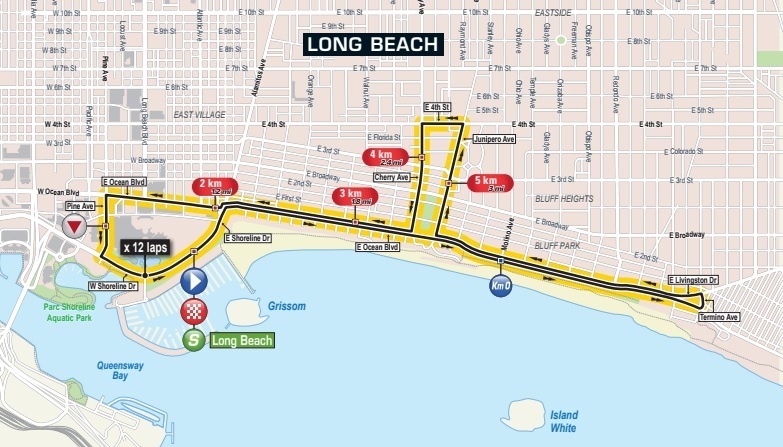 A field sprint is expected for the finish of the Long Beach circuit, so spectators crowding the start/finish line near Shoreline Village should be in for an exciting showdown. Unfortunately, those watching the tour in Long Beach will not get to see the start of the women’s tour. Local fans will have to wait (and travel) to see the world’s best women cyclists compete during The Amgen Tour of California Women’s Race empowered with SRAM, which kicks off later in the week on Thursday, May 17 in Elk Grove and finishes in Sacramento on Saturday, May 19. The women will race upwards of 187 miles over three stages, compared to the 645 miles and seven stages of the men’s race, which also ends on May 19. Presented by Visit California, check out the visual overview of both the men’s and women’s courses here. Attendees, tour and city officials were escorted by police around the block to participate in a mock race following the route announcement. Kerstin Kansteiner, owner of Portfolio Coffeehouse, which is located on the corner where the circuit makes a left turn onto Retro Row, was at the press conference, which took place in front of her business, following a meeting with members of the 4th Street Business Association. This is in contrast to what local news outlets reported last month, that Shoreline Village area restaurants were less than excited that the tour was taking place on Mother’s Day, especially with the initial route restricting some access to waterfront eateries during one of their most profitable days. 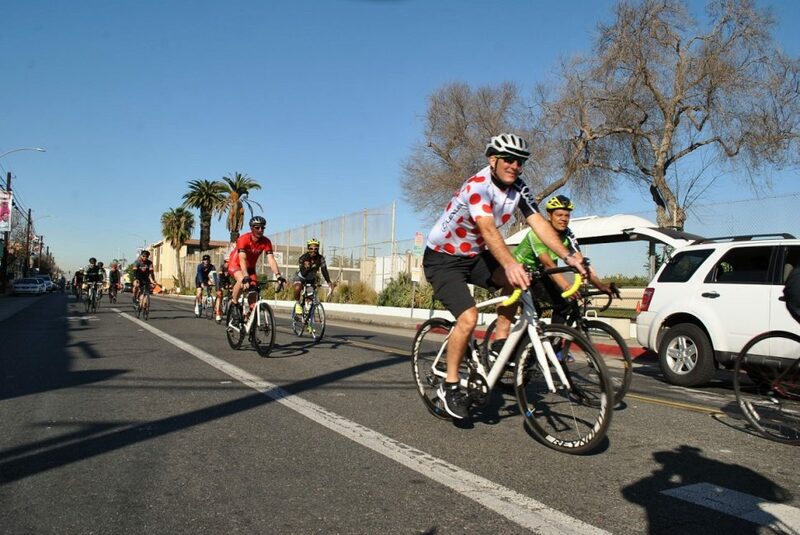 The finalized route announced this morning is a revised version following the Downtown Long Beach Alliance (DLBA)’s request for revisions to the course among other changes. “Mother’s Day is Super Bowl Sunday for most restaurateurs and their employees, so the concerns, beyond changing the race date, were mostly addressed with a series of discussions with city staff and stakeholders from the area,” Kraig Kojian, president and CEO of the DLBA, told the Post in an email. Not using Broadway west of Alamitos Avenue and expanding the ingress and egress on all downtown streets involved with the course were revisions that were made, allowing the course to be shared and for two-way vehicular traffic on Ocean Boulevard west of Alamitos, Pine Avenue south of Ocean to the Pine Avenue Circle and Shoreline Drive west of Shoreline Village Drive, Kojian said. As a former pro tour rider and U.S national champion who has competed in multiple world championships, world cups and international tours, as well as four Amgen TOCs and as the city’s “Bike Ambassador”, Cruz voiced during the press conference that he was tearing up slightly as memories of his own professional racing career seemed to come full circle. For more information on the Amgen Tour of California, visit the website here.